Last month we were a guest blogger for our friends at Darice. We created two fun fall cards with products from Darice. You can see that post on their blog here. We are excited to share that post here as well. Fall is so vibrant. Everything sparkles when the wind blows. 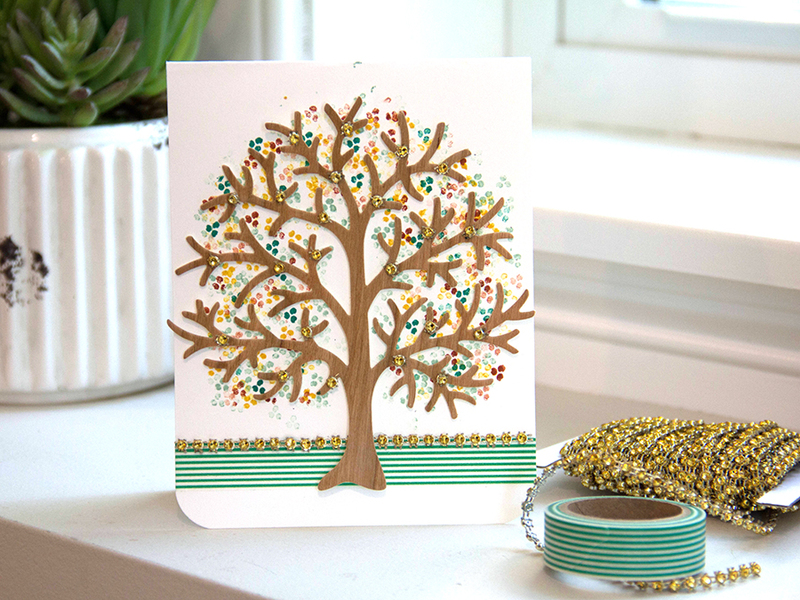 The ever-changing fall season inspired these DIY handmade cards. Create card base. Cut white card stock to 4.25″ x 11″. Score and fold in half. Round each bottom corner of card with the Corner Punch. 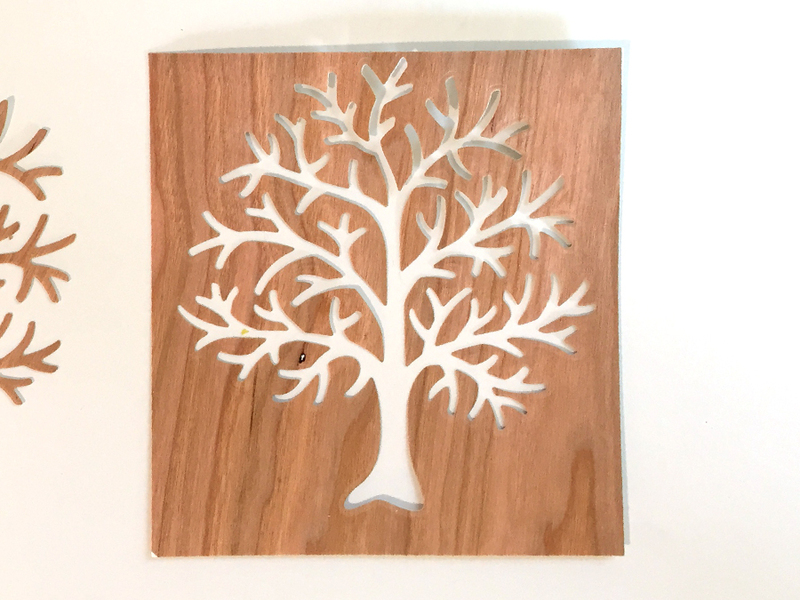 Cut a piece of 5″ x 5″ Cherry Wood Paper. 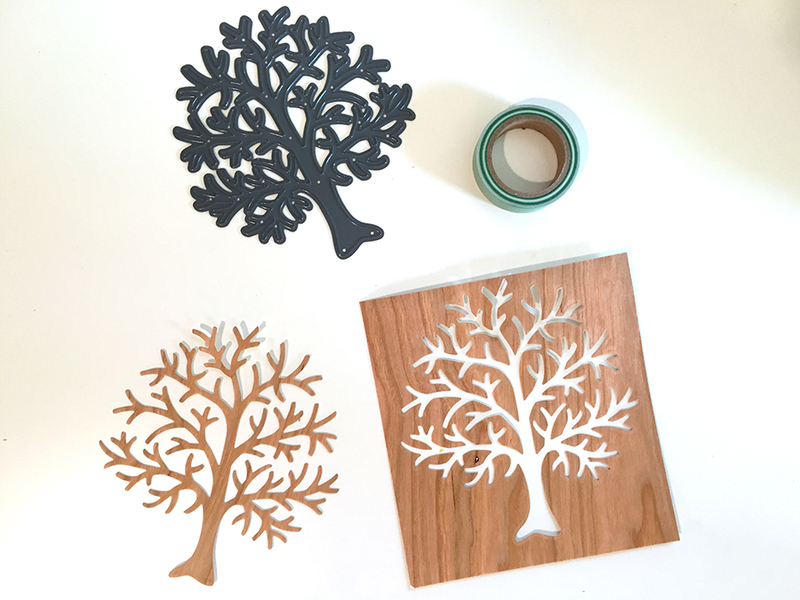 Die cut the Cherry Wood paper with Branched Tree Die using a manual die cutting machine. Save the 5″ x 5″ negative space for second card. Create a simple handmade stamp from a pencil eraser. 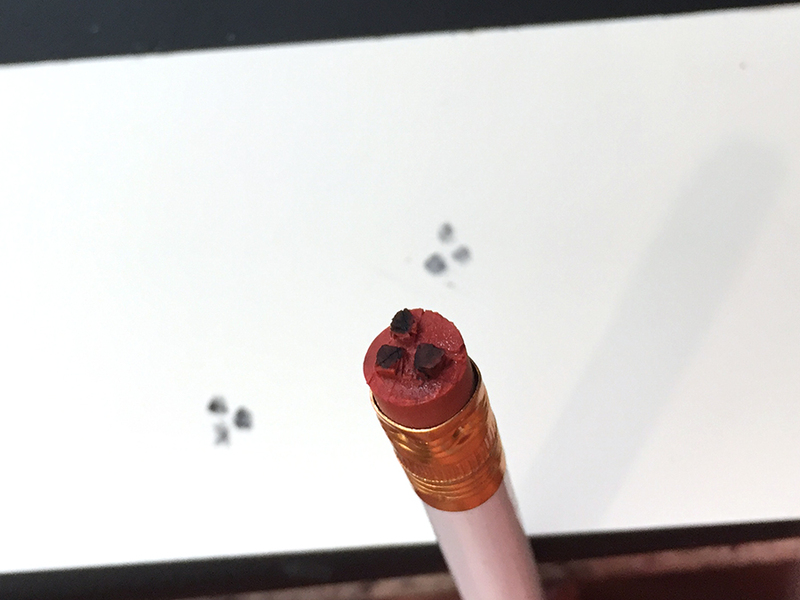 Draw three small dots onto the top of the eraser Carve the negative space away from the three small dots with an X-Acto knife. Stamp to be sure you get the desired shape. 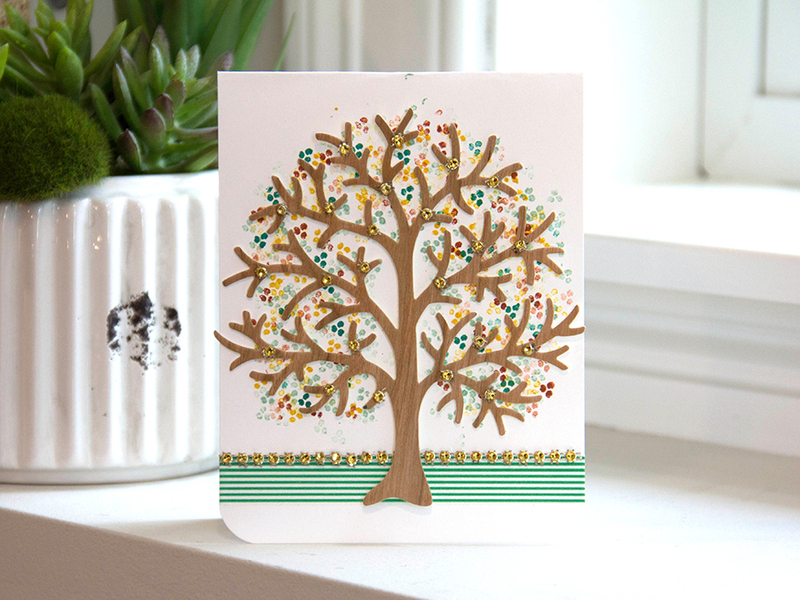 To create the multi-colored leaves of the tree, randomly stamp dot images on the white card stock in the varying ink colors, Mowed Lawn, Wild Honey, Sage Green and Mustard Seed. Stamp full strength color and continue to stamp color off to get varying shades of ink. 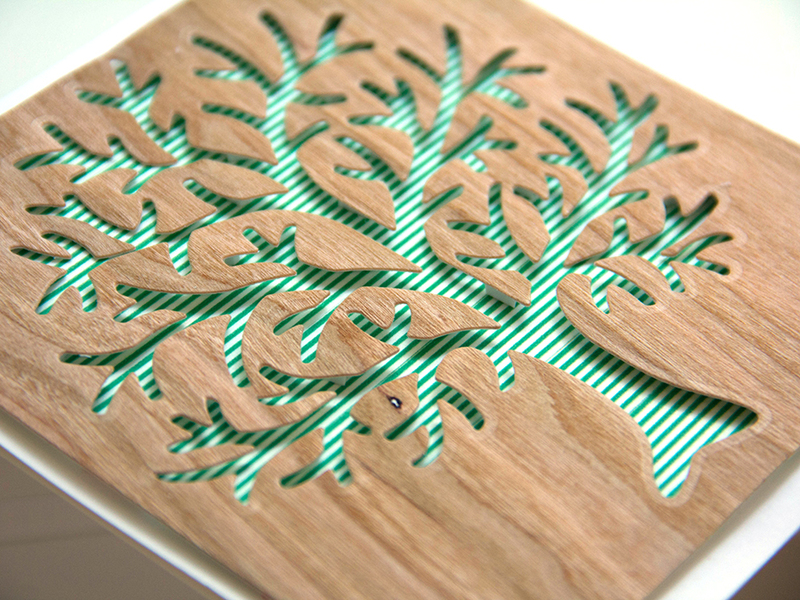 Adhere a row of Green Striped Washi tape to bottom of the card front. 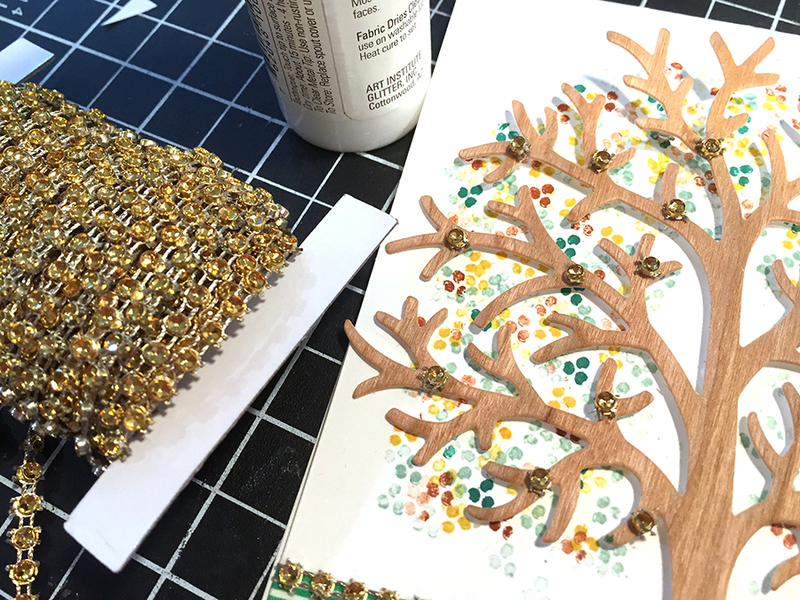 Glue a row of Gold Bling above the row of Green Striped Washi Tape. 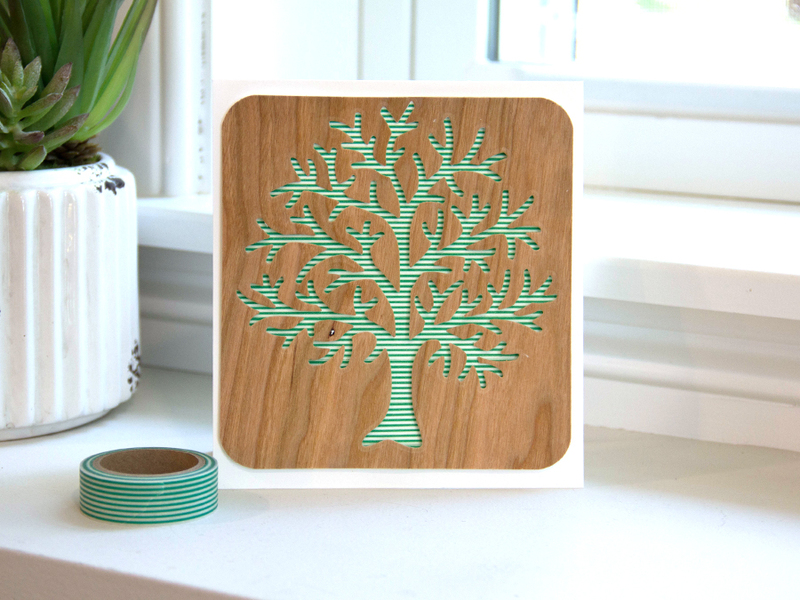 Lay the Cherry Wood paper Tree die cut over the stamped tree shape. Adhere with 3D foam squares. Trim 3D foam squares if needed. Cut Gold Bling string into individual pieces (approx. 20) and adhere single pieces to the tree branches with Aleene’s Quick Dry Glue. Create card base. Cut white card stock to 5.5″ x 11″. Score and fold in half. 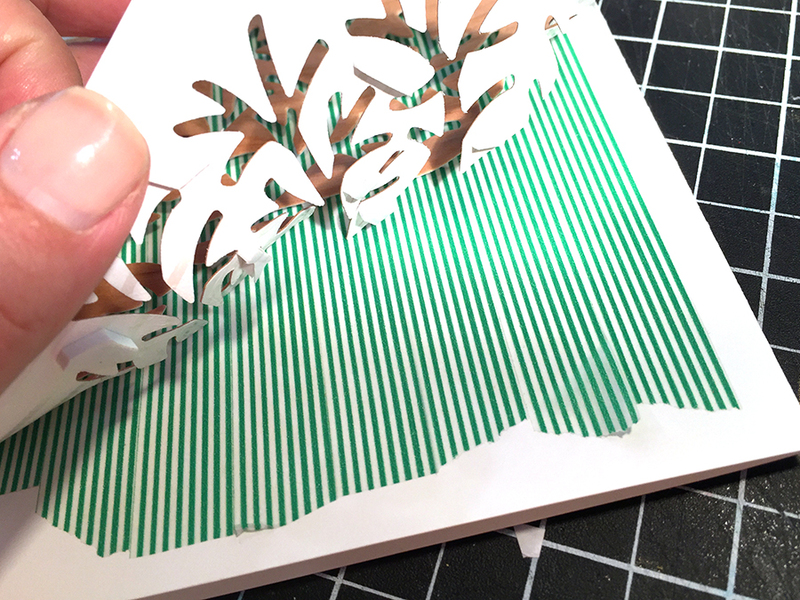 Line the card front with the Green Striped Washi tape. Cover entire card front leaving only .5″ of white card space from each edge. 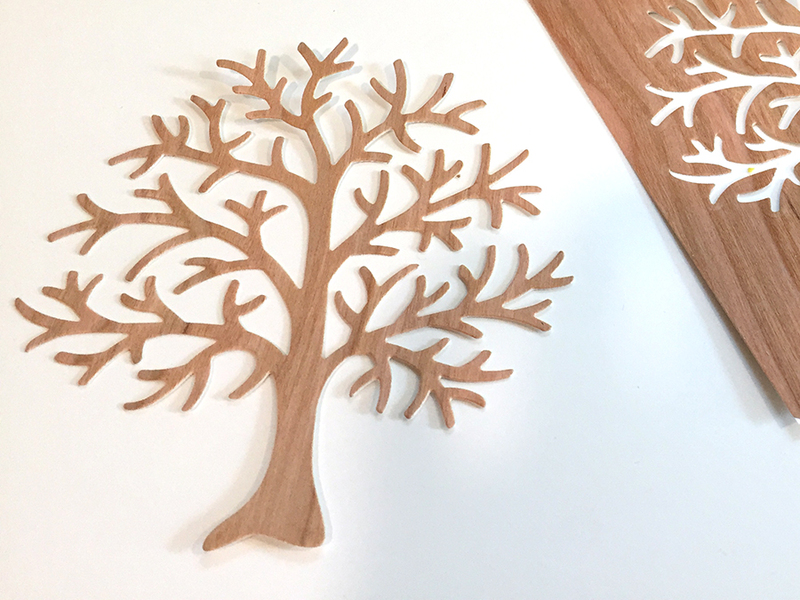 Cut negative tree shape down to 4.75″ x 4.5″. Use the corner round punch to round each corner. 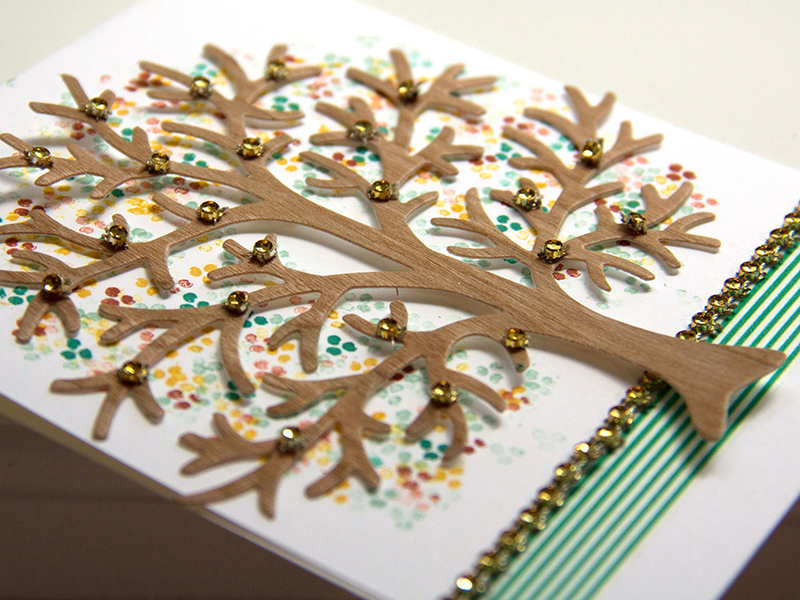 Center and adhere negative tree shape to card front with 3D foam squares. 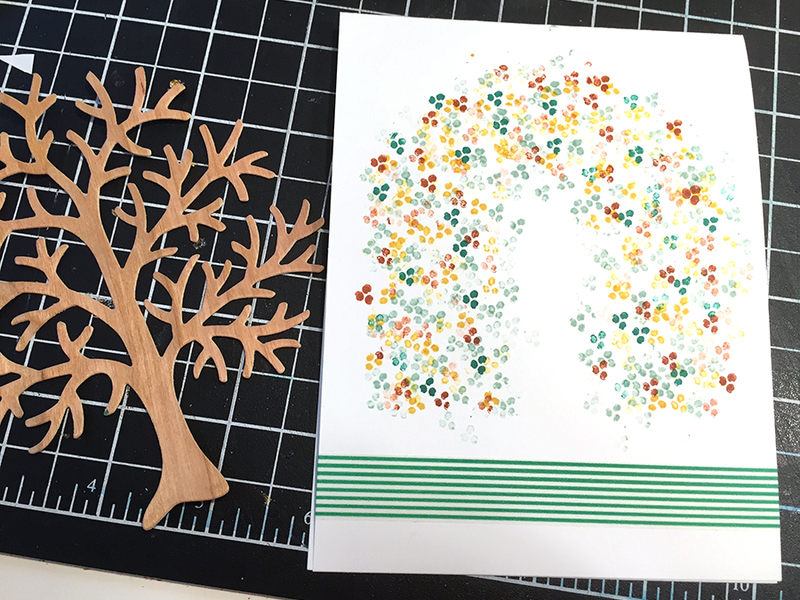 There you have it … two handmade festive fall cards, using Real Wood paper! This entry was posted in DIY Projects, Stationery & Envelopes and tagged Cherry Wood paper, Darice, Fall Cards, Tree card.